Hopefully some of those will result in better video broadcasts, with better color, sharper images, less graininess at night, less shakiness and less problems. The download speed is potentially doubled, depending on the network, but the upload speed is unchanged, so that will be of little help. Another benefit is the integrated Siri voice assistant, which will apparently allow me to do more hands-free while driving, such as getting addresses and directions, sending texts, etc. I'll have to wait to see it in action. Will it be worth $200 plus $55 tax to upgrade? I guess I'll find out in a week, because I've already ordered one! My wife should be grateful to get my iPhone 4. It's a shame that Steve Jobs had to pass the day after it came out. This is his legacy. The autumnal equinox occurs on MJD 55827.378 (2011 Sept. 23 09:04 UTC) or 9h13 in the morning, Paris mean time. Therefore, according to the rule in effect during the French Revolution, MJD 55827 (23 September in the Gregorian calendar) will be the first day of year CCXX in the Republican Calendar. According to the rule used by Brumaire, including their iPhone and iPad apps, MJD 55827 is also the first day of the 220th Republican year. The day before, MJD 55826 (22 September), is a leap day according to Brumaire, but not according to the official calendar rule. Dates prior to this are different by one day, but with the start of the new year, dates will be the same by both rules until 2014. The first month of the Republican calendar is Vendémiaire, so New Year's Day is 1 Vendémiaire. Happy new year! I found this video by a guy who actually had a mechanical "metric clock" made for him. Btw, I'm using the new Blogger app on my iPad to write this. Maybe now I'll post more often. But it leads me to wonder again why anybody makes iPhone apps that aren't formatted for iPads. Finally, people are starting to make apps formatted for iPad. Salut et Fraternité for iPad by Brumaire is a port of the Salut et Fraternité app for iPhone, which displays the current French Republican calendar date and decimal time, and allows you to convert between Republican and Gregorian dates. Unfortunately, instead of simply updating the original app for iPad, they made it a separate app, forcing you to pay $1.99 for both. The iPad version is pretty much the same as the original, but looks better on the bigger screen. Also, instead of a separate tab for the decimal time watch, you select a setting to have it displayed on the main tab. However, for some reason the season images don't appear for me on the "Convert" tab after I turn them on. If you already have the iPhone version, you might want to simply use that on your iPad, rather than pay twice, even if it does look a bit crappy, although another two bucks at least won't set you back much. 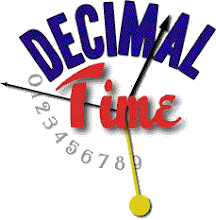 Decimal Time: Unlike the metric system of measurements, decimal time did not survive the French Revolution. But is dividing the day by tens a possibility for the future? Revol-di 1.0 by Kodaski.fr was released 2011 January 20 (55581) and is the third French Republican Calendar app for the iPhone. The name is taken from an early proposal for the first day of the décade, better known as Primidi. Unlike Calendrier and Salut et Fraternité, this one is free. Unfortunately, like the others, it is formatted only for the iPhone (and iPod Touch) and not the iPad. (It's been over a year, why doesn't everybody recognize the iPad?) Also unlike the others, it is targeted at genealogists, so it only converts dates during the revolutionary period when the calendar was in effect, 1792-1805 (JD 2375840-2380688), and does not convert more recent dates, nor does it display decimal time. At least it does not have to worry about which method to use for determining modern dates. It does have features the others don't, however. For one, you can make notes, which are stored under the (Gregorian) date they are made. This is useful for recording birth dates and such during the Revolution. The entire notepad may then be shared via email. Under "Information", facsimiles of the laws relating to the Republican Calendar are available, in French. (Gregorian dates are also displayed in French.) "Historical context" gives information about the calendar. "The calendar months Illustrations" shows period paintings of calendar girls. There is a "Help" section and four different wallpapers to choose from. Nonidi 9 Prairial an CCXIX à 4hd 50md t.m.P. The Skynet missile defense system goes online April 19, 2011, declares war on mankind, and triggers a nuclear apocalypse two days later. The exact time is frequently given on the Internet as 20:11, or 8:11 p.m., although I don't know what time zone this is supposed to be, nor can I find the exact quote this time was taken from. I also find it curious that the time is the same as the year, suggesting that someone may have mistaken one for the other. If it's Eastern Time, it just now happened. I believe that Skynet was located in Colorado, which could mean that we have two more hours. If it's Universal Time, then it would correspond to MJD 55670.841, which was several hours ago. The Skynet Funding Bill is passed. The system goes on-line August 4th, 1997. Human decisions are removed from strategic defense. Skynet begins to learn at a geometric rate. It becomes self-aware at 2:14 a.m. Eastern time, August 29th. In a panic, they try to pull the plug. Judgment Day is averted at the end of this movie, but in Terminator 3, which was released in 2003, we find that it was merely delayed until July 25, 2004 6:18 pm Eastern Time (53211.929). I've been busy playing with my new iPad 2 for the past couple of weeks. When I first connected it with iTunes, it transferred over all my hundreds of iPhone apps. I noticed right away that these fell into two categories. Some apps open in a small window, slightly larger than the iPhone screen, with a "2X" button that enlarges it to fill most, but not all, of the screen, but generally making the graphics blurry and pixelated with elements that are not formatted for that size. Other apps are formatted for the iPad and fill the whole screen. The latter are indicated by a plus sign on their purchase buttons in the app store, and are called "universal apps", meaning that they are designed to work on all iOS devices, so that they are formatted for both iPhone and iPad. I also downloaded a bunch of iPad apps, which do not run at all on iPhones, although almost all iPhone apps will run on an iPad, even if not designed for it. On Wednesday (55657) ecce updated the MetricClock for iPad Free app to version 1.4, adding the ability to use backgrounds from your camera roll, and set the clock color. When I updated to the new version, my clock disappeared, but after I deleted and downloaded it again, it worked fine. The only other decimal time iPad app I could find is Julian Date Converter, which is the iPad version of Julian Date Calculator for iPhone. This app, which costs a dollar more at $1.99, takes advantage of the larger screen by showing twelve different decimal times at once, while the iPhone version only shows the Julian Date and one other at a time. The iPad version includes one decimal time format that the iPhone one does not, GPS Time, and also displays the sidereal time and longitude, and also has the feature to "lock to UTC", which keeps all the times synchronized with the current time, incremented once a second. Last week Macrosoft (not to be confused with Microsoft) issued a press release announcing that the company was converting to metric time. Of course, this was a not-very original April Fool's joke, but it may be the first with a YouTube video. In the United Kingdom, proposals are repeatedly made to move the clocks forward. Like most northern countries, the UK currently moves their clocks one hour forward in spring and back in the autumn. From the last Sunday of October to the last Sunday of March, Britain is on Greenwich Mean Time, also known as Universal Time or Western European Time. Then from March to October, they are on British Summer Time, i.e. one hour ahead of GMT. There are now two different proposals being discussed. One is to move the entire country one hour ahead of the current times all year, i.e. one hour ahead of GMT from October to March, and two hours ahead of GMT from March to October, which is called "double summer time". The other is to keep Scotland the same, and change the rest of the UK, i.e. England, Wales and Northern Ireland, so that the country would be divided into two time zones. The reason to exclude Scotland from the change is that the further to the north and west you go, the later the sun comes up, so that on the shortest days it wouldn't rise until about ten o'clock, and on the longest days it would set after eleven in the evening. This is just too late for some Scots. But having two time zones would obviously put parts of the country out of kilter. One of the motivations for moving forward an hour is to be in the same time zone as most of the European Union, Central European Time. Currently in the EU, only Ireland and Portugal are also on Western European Time. It has been tried before. During World War II, Britain was on the same system, being one hour ahead of GMT in winter, and two in summer. And for three years, from 1968 to 1971, they were on Daylight Saving Time all year, i.e. GMT+1, although without double summer time. I have never understood the desire to tinker with time. Why not simply get up earlier in the morning? All you have to do is change work schedules. Why mess with the clocks? Just let everyone quit (and start) work an hour earlier. There are a number of arguments to advance the time, most of which seem specious to me. I wonder what the real motivations are? Another post, another app. This one may look familiar, because (as the name suggests) its a free version of ecce's MetricClock app for iPhone. The differences are, first, iAds in the free version, and second, no ability to change settings, such as color, digital display, custom image background, etc., although you can still move the clock face around and resize it. It also does not display the percentage of your life span. So if you want to try before you buy, or you just don't care about any of that, you can now get this free app. There are also iPad versions of both the paid and free apps, which I never noticed before, since I don't have one of those devices, yet. They appear to be the same as the iPhone versions, just reformatted. I am on the road a lot, and I used to listen to talk radio, such as NPR, but when I got my first iPod I started listening to podcasts, since I did not have to depend upon whatever happened to be on at a particular time, and I could pause playback. I also had a mono Bluetooth headset for talking on my "feature" phone, which I also used when I upgraded to an iPhone, a Motorola H680. Although this worked fine for talking on the phone, I still had to switch to the earphones on a cord to listen to podcasts, with one in my ear and the other dangling so I don't get a ticket. (For music, I just listen to the radio through car speakers.) The problem with this is getting tangled in the cord and seatbelt, especially while the phone is plugged into the charger, as well as smashing it in the door, etc. I have ruined several iPod headphones that way. After a few months, I found the Bluetooth Mono for iPhone jailbreak tweak, which solved the problem beautifully. However, it required that I had to keep jailbreaking my iPhone every time Apple updated the firmware, which means waiting weeks or months for a new jailbreak before updating, or going without, which I was forced to do for a couple of months when I got a new iPhone. The current jailbreak method is still "tethered", meaning that it will break if I reboot, although that has not been a problem. Jailbreaking also offers a lot of other great stuff, but everything else I really wanted is now available without jailbreaking. Except playing music and podcasts through a mono Bluetooth headset. But there are alternatives. iPhones now support the A2DP stereo Bluetooth profile, and there are mono headsets which will support A2DP. After hearing several recommendations, I got the Aliph Jawbone ICON. It sells for $99.95 at the Apple Store, but Best Buy had it on sale for $20 off. The same day I got the Jawbone, my wife bought a Plantronics BackBeat 903+ Bluetooth stereo headset from the Apple Store for $99.95. She already had a Motorola MOTOROKR S9-HD. So now I have four Bluetooth headsets available to me, and I can make some comparisons. Both headsets have a lower volume than the wired headphones, which makes it difficult to hear podcasts in a noisy environment, such as a moving car in traffic with passengers. The sound on the Jawbone seems to be richer than on the Motorola, although it's hard to tell for sure. The ICON also seemed to have better noise reduction, which is supposed to work by having a sensor in contact with your cheek. But then my wife had to go and buy the Plantronics BackBeat 903+! This stereo headset goes in both ears and includes separate buttons for phone, volume up and down, and pause/play. It also has impressive volume, and is rated for 7 hours of listen time. She was unsatisfied with the Motorola MOTOROKR because all the electronics are in a band that goes behind the neck, making it uncomfortable to lie down with it; plus, she keeps losing ear-buds, and complains that it's not loud enough. The Backbeat has the electronics behind each hear, with a thin, flexible cord connecting them, which is quite comfortable to lie on. And it means that you can pop it out of one ear, and have it dangle from the other, making it safe and legal to drive with! It turns out that her stereo headset may actually be a better solution than any mono one. I will continue using the Jawbone ICON for now, but I may end up borrowing my wife's BackBeat, at least when she's not using it.